Died age 25 years. Also buried in the same grave is her brother John Sweet, who died age 13 months in 1873. A report in the Bacchus Marsh newspaper – 24th June 1893 states – Death of Mrs. J. Gelletly, Golden Point, after childbirth of a daughter. (Mr. Gelletly, a Blacksmith). Mrs. Gelletly, eldest daughter of G.Sweet. Married three years, leaves one child, 18 months old. So sad for a mother to die so young.- records show Maggie was named Margaret Sweet and married John Gelletly, (born in Glascow), in 1890 when she was 22 yrs old. Margaret and John Gelletly had one other child recorded as born in Blackwood – David John Sweet Gelletly born 1891 and then George James McAusland Gelletly born 1893. So the newspaper seems to have got it wrong, as Maggie did not die after the death of a daughter, but a son born 1893 – George James McAusland Gelletly when her youngest son David was 18 months old. Digger death records have her name as Margaret Gelletly born 1868 with parents – George Sweet and Catherine Toomey, died age 25 years at Blackwood, and born in Blackwood in 1868. 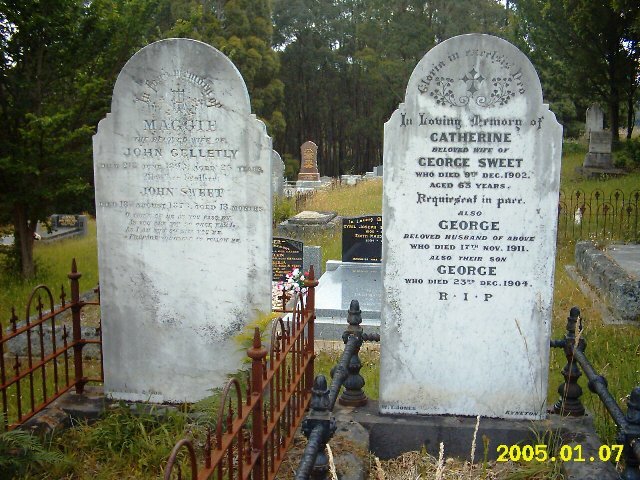 In the next grave are her parents, George and Catherine Sweet. Then records show that John Gelletly remarried in 1896 to Jane Matilda Bourchier and they had two children born at Birregurra, John Bertram Gelletly in 1901, Constance Jean Gelletly born in 1904. Jane Matilda Bourchier died in 1951 at Colac age 77 yrs with parents listed as Isaac William Bourchier and Jane Stuart Tods. 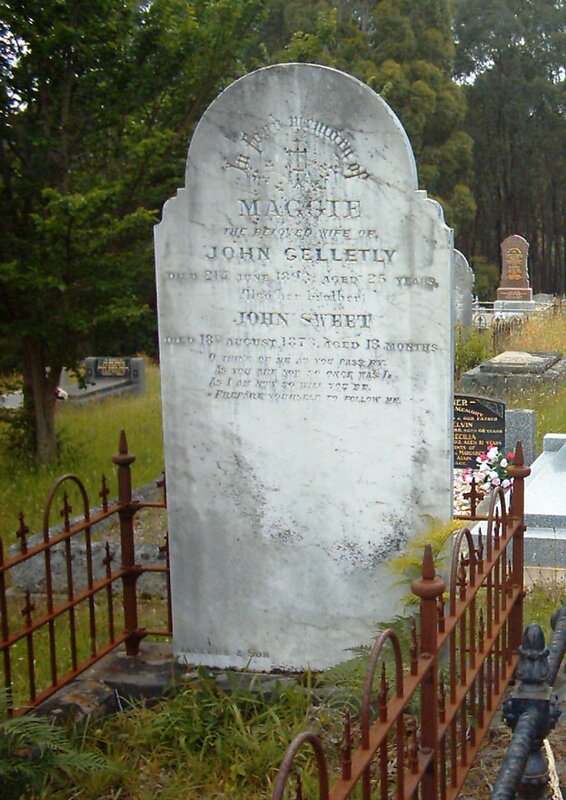 John Gelletly died in Birregurra, age 88 yrs in 1954, with parents John Gelletly and Agnes McCausland.